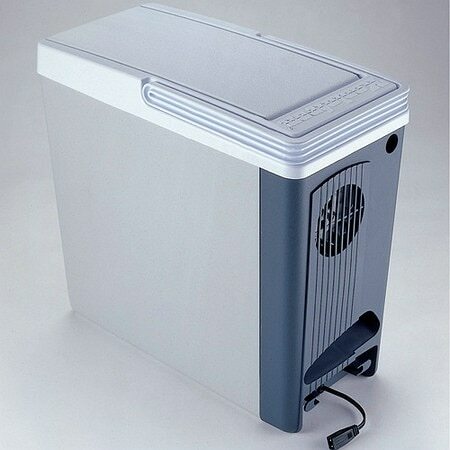 Koolatron Compact 12V Cooler1.0 ea. The Koolatron P20 Compact Cooler was specially developed to fit in those tight spaces between and behind the seats of your car, minivan or truck. This cooler plugs directly into the 12 volt receptacle in your vehicle to cool without any ice. Also, with a flip of a plug you can turn this cooler into a warmer to keep foods warm up to 135F (57C). The P20 Compact Cooler has an 18 quart capacity, which can fit up to 23 regular sized (12 oz.) cans. The latch-less lid can be opened with one hand and also features a swinging foldaway handle for easy carrying. This is the ideal cooler for families on-the go. Pack the P20 cooler with snacks for family trips or drinks for your next sporting event. With the Koolatron AC Adapter (sold separately) you can also plug the P20 Compact Cooler into any standard outlet in your home, cottage or hotel.